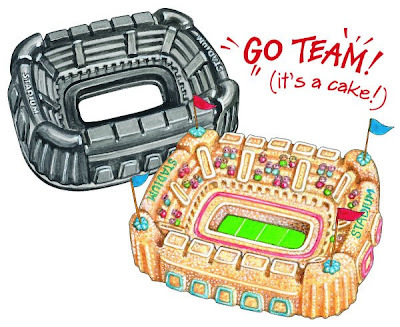 I stumbled upon this great stadium cake pan while checking out one of my favorite sites - Gooseberry Patch. This is perfect for any Super Bowl party (in two weeks) and think about those college games in the fall! I think it would be fun to make a huge rice crispy treat using this mold and then just decorate as you would a cake. Check out Gooseberry Patch if you would like one and they are currently on sale for $16.95! Psst....if anyone does buy one I would love to see your creation.